St. Croix Government Retirees, Inc. is as anxiously concerned about the status of the Government Employees Retirement System as every member should be. After frustratingly exhaustive studies and discussions, we have concluded the most remediable component of the imminent calamity is the imparity of representation. Consequently, this body has commenced with the necessary steps for an Initiative petition to bring responsibility and accountability to the investment we have made in the GERS. Article IV of the United States Constitution guarantees a republican form of government. The 1954 Revised Organic Act decreed a republican form of government with the structure it established for the US Virgin Islands. 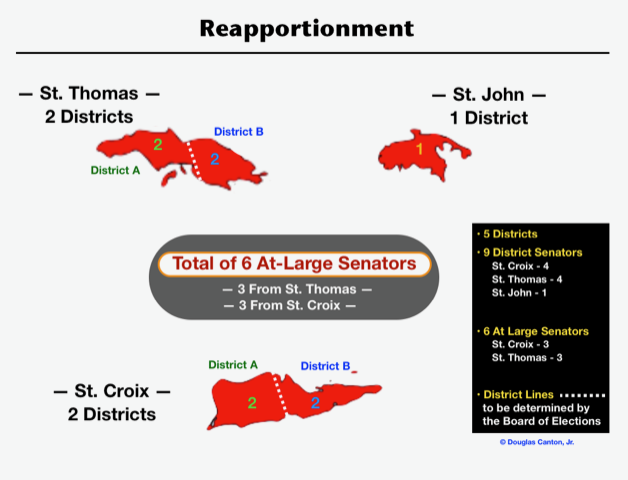 The Reapportionment Initiative will restructure the legislature from 2 separate legislative districts into 5 separate legislative districts. The legislature will continue to have 15 senators: 9 district senators and 6 at-large senators. Absentee voters cannot sign a petition of the Election System. You may also call Ras Herman 642-9098 in STT, and Mary Moorhead 277-7485 in STX to sign Reapportionment Initiative Petition. Virgin Islanders residing outside of the VI Territory must request to VI Election System for Absentee voting to protect their Virgin Islands' interest and to vote "Yes" for the Reapportionment Initiative proposal March 30, 2019. You can continue to vote as long as you DO NOT vote elsewhere. Voter registration will close February 27, 2019, and Early Voting should be the week of March 18, 2019. Radio Ads for Reapportionment will air on STX 97 AM and 93.5 FM, and STT 1000 AM and 1340 AM the month of February and March. Distribution of the flyer is happening in housing communities door-to-door in Stx. In March the door to door flyer distribution will happen in STT. © 2015-2018 St. Croix Government Retirees, Inc.